The weather had been so good for so long, there was a high chance that it would break in the meet, but the north west was calling a select few of us regardless. A mixed group of tickers and runners arrived at Inver Croft in the mist and rain, but thankfully Alan H had put on the water and lights and built a welcoming fire. In June. The history of the building was palpable and the photos confirmed the commitment of the members of the Jacobite MC who travelled up for 50 weekends(??!!) to firstly build a bridge and then use it to clear out a ton of sheep droppings, bring in materials to make the building watertight and haul a cooker in. I couldn't help but wonder how the EMC would have fared with the task. Saturday dawned dry, but by 9am it was tipping it down. Despite the drenching, Mike and Fiona managed the tops on Slioch, Harsh and Alex got up Fionn Bheinn and Tim did An Ruadh Stac and Maol Chean dearg. Alan increased his Corbett tally with Creag Dubh Mhor on the east of Lochcarron. I sheltered in the shed by Glenuaig Lodge in the hope that the rain would ease, but it didn't until 1pm, and then for only one short-lived hour. Maoile Lunndaidh is in my opinion justly named the bald hill of the wet place; I couldn't even see the corrie, apparently it's one redeeming feature. 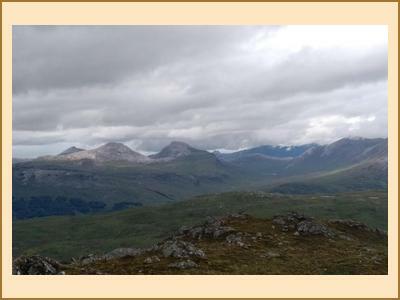 Claire and Neil had the dubious pleasure of running the same hill plus Sgurr a Chaorachain and Sgurr Choinnich. What possessed them, I don't know. Thankfully, Alex was more adept at building fires than me, so by the time the others got back, the building was warm and the hot water urn was bubbling. Not being able to shower was mitigated by dry clothes, the camaraderie and huge bowls of food. Alex won that one. Another sunny morning saw Mike and Fiona head to ML on Sunday with an early start to avoid what Fiona described as a third days soaking. Alex was staying up for a few days, so he took on the big day with ML, SaC and SC. I can't be bothered to spell them all out again. 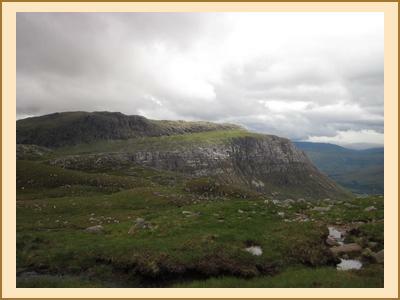 Tim went off to Beinn Tharsuinn and its neighbour, and Alan headed south to bag Creag Dubh by Newtonmore. Clearly he was after black crags this weekend. Getting his fill before Oz, maybe? Harsh and I drove to the dry and warm south. Despite, or maybe because of the weather, it was quite a special meet. We clearly all had an inner shepherd.